Building two new 4 SQ. One for 40m other for 80m. Starting off with SJ2W's pcb and will go from there. Relays are DPDT, 250VAC, 8A versions from Farnell Code 1629053 so far have been good to well over 400W so use for SDR RX and QRP TX shouldn't be a problem. The torroids T225-2B I have already and several 500V SM caps, again over kill for QRP. The SO239 were from a batch buy so decided to use all 10 in one go. Just tacked in place for now until I finalise the enclosures, I have several of same type used on E51KTA trip but not sure about UV stability, Might invest in some dicast or IP56 ones. I'll add the rest of the components once I have the switch and dummy load/power meter sorted out, the signal I'll feed into an Arduino Uno or Nano I expect to do the power measurement. These will be remote switched for the direction (the relays are not latching type so will need to have them energised for use) so I'll be using USB and Arduino to create the switching voltages. I might add a sense so can sample the frequency, not sure what value that might be though. Poles will separated by 1/4 wavelength and will support 1/4 wavelength 40m and 80m ground planes (Poles fibreglass 10m and 18m), wire elements 2mm I expect. Extensive radial matt. Will probably put the antennas up splitting the 4 points of the compass to get reasonable coverage. I expect I might experiment with a 5th central GP and see what difference that makes. Remember DENCO / Q-MAX coils from the 50s/60s ? Using 3D printer to make them. Finished coil + data. STL files http://www.sm0vpo.com soon. In the workshop looked for the antenna bits for the 23cm transverter to find the 23cm antenna (and a 70cm one) had basically been crushed under some items that I had 'stored' in there... oops! So rather than try to fix as the booms were well mangled I am going to try to make from scratch. Following http://www.pa3hcm.nl/?p=650 I am going to basically try and create a short 23cm antenna on a Ali boom using welding rods and a length of 6mm copper tubing (was from an A/C unit I think). 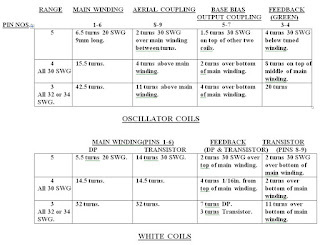 I will use a copy of the DL6WU spreadsheet I have from previous as that site's link doesn't work now. Copied from that site... I'll basically use materials I will either have to hand or will get. YEs understand 1mm out on the length is MHz so test of my skills.... Semi rigid hardline I have a few options for the matching section. Because of low weight and easy handling I mostly use aluminium to construct VHF/UHF antennas. This material is also easy to drill, saw and grind. You can buy it in most DIY shops. For this antenna I bought an square bar (15x15mm), made of aluminium, length 1 meter. At one end I mounted a standard available mast mount, leaving about 90cm for the actual antenna. 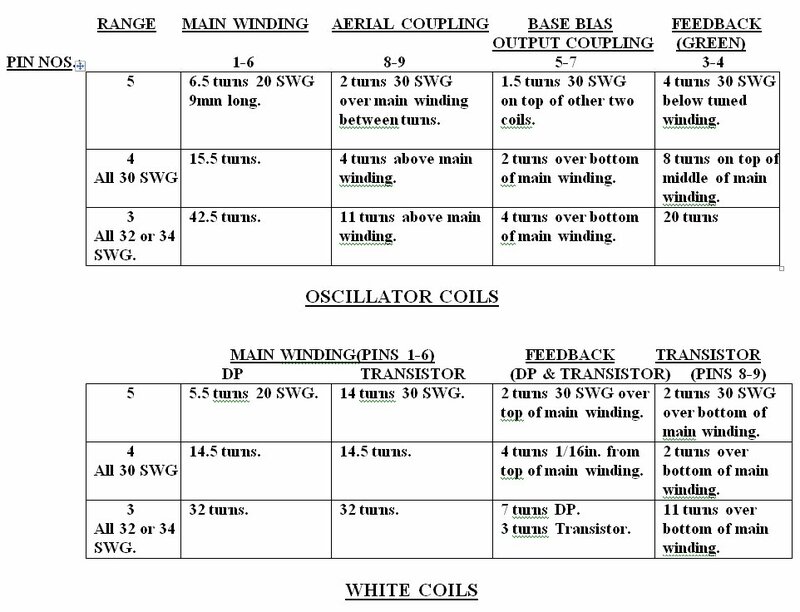 Using the DL6WU formulae, this results in a 14 element yagi, with a gain of over 13 dBd. I used the DL6WU spreadsheet calculator of DF2CK to calculate all measurements. I used AlMg3 welding rods for the radials. These rods have a diameter of 4 mm. 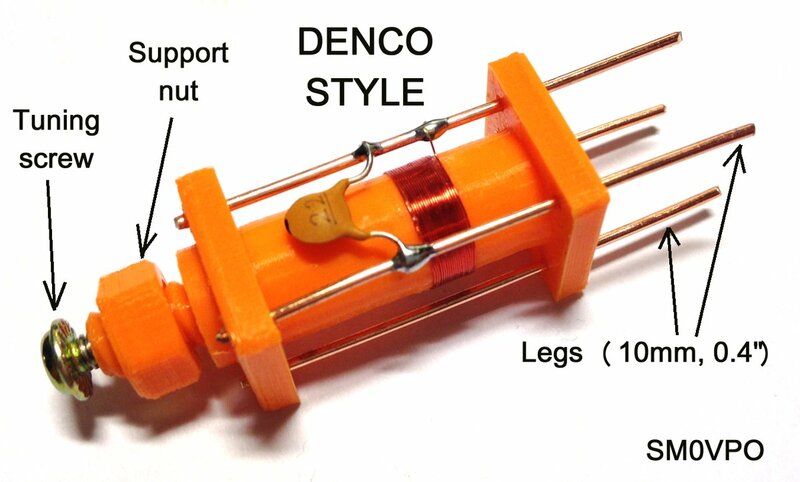 The dipole is made of 6 mm2 copper wire, matched with a matching loop (1/2 wavelength coax or semi-rigid) and mounted to a female N connector. Just for fun (isn't all amateur radio?) as the nights start to draw in I am going to see if can build a pseudo auto 160m qrp station for FT8 based on (WSJT-X Version 1.8.0-rc2) https://physics.princeton.edu/pulsar/k1jt/wsjtx.html and, have it running through the winter on 160m (when I am in the shack anyway) so that it kinda makes automatic qso, calling CQ of course not S&P... I wonder how long it would take to work a few DXCC qrp? Yes I know it doesn't do this automatically I will have to augment the source to do this. Might even use a Wellgood loop for the 160m RX. Inverted L for the TX antenna. Looks like will need a homebrew SSB TX (maybe the qrp2004, but just 160m) https://groups.yahoo.com/neo/groups/qrp2004/fileshttp://myweb.tiscali.co.uk/qrp2004/ and https://groups.yahoo.com/neo/groups/qrp2004/files and a dedicated laptop. Odd request in local club but was asked could I build a couple of 1W TX using xtals (NOT DDS etc) for 14.040 and 14.050 as a couple wanted to test IMD performance of their PA. You input both at same time and watch the output for harmonics etc... they had used large TRX to generate the signals. Anyway seems easy enough and will allow me to add to the test kit. So after checking the workshop components I will use the GQRP designs and the VU TX version and building a pair on tiny 4cm x 6cm prototyping boards I had been sent a while back. 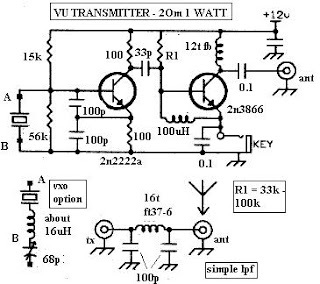 The 2N3866 I'll use a GQRP club transistor (from 2006 (ish) Jan/G0BBL). All transistors will be heat sinked as I expect this will be running 100% duty cycle for a bit. Will probably not bother with the LPF as this will be used in testing not on air. Photos and oscilloscope outputs to follow.